April’s the month where you can gladly wave goodbye to winter and fondly embrace spring. Jetting off to a warm and tempting holiday destination means you can welcome the sun with an April villa holiday! Alluring Mediterranean regions sit at splendid temperatures of up to 22°C in the early spring. We've delved into some of the best holiday destinations to give you some inspiration for your April getaway. In April, spring is on the horizon. 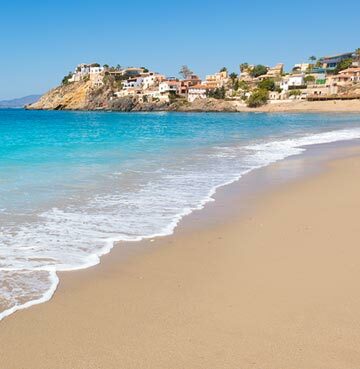 The Mediterranean and beyond will be hard to resist, with perfect temperatures gracing the irresistible sandy shores. And a villa is your own little haven to make your holiday a special and memorable one. Uncover the delight of Costa Calida. It may not be the first name to spring into your thoughts when you think of Spain, yet this coastal gem promises to leave you with dazzling memories and an urge to return! It boasts a unique climate unlike anywhere else in the country, shining with 315 days of sun per year. And with temperatures reaching 21°C in April, it makes for an idyllic sun-kissed holiday destination for your early spring plans. You’ll find irresistible far stretching sandy beaches along this south eastern stretch. Be tempted by its inviting crystal waters for a refreshing swim. Fertile lands mean fresh fruit and vegetables are aplenty in the area. It’s easy to see why local chefs are so inspired to create tempting dishes! Treat your taste buds to flavoursome tapas, or relax and sip on a cool jug of Sangria to the rhythms of Flamenco notes in the evening sun. The region has made a name for itself as an almond growing area, so go nuts with delicious cakes and desserts! With this tantalising combination alongside 100 incredible villas to choose from, Costa Calida is the ultimate April holiday destination as you spend spring in Spain! You’ll fall in love with the little island of Gozo based in the Mediterranean Sea. Just a 5km stretch of ocean separates this gem from neighbouring Malta. Calmer and more serene than its sister island, its rural heartbeat and emerald countryside views will treat all of your senses. You’ll see why Gozo is an idyllic choice for your April villa holiday. Especially when temperatures reach an enticing 22°C in the early spring! Home to less than 32,000 people, the lands are strewn with small towns, complete with colourful streets and rugged hillsides. 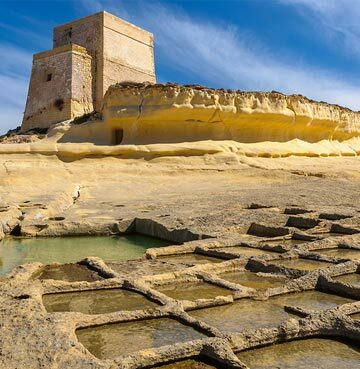 Discover Gozo’s intriguing past with a visit to Xlendi Tower or the UNESCO World Heritage Site of the Ggantija Temples. Be drawn in by the history glowing from among the rocky limestone walls. This is a wonderful spot to enjoy a day of exploring and learning about the island’s rich history. Or perhaps you fancy an underwater adventure? Gozo is home to some of the best diving spots in Europe. Whether you’re a beginner or a seasoned expert, the island caters for all levels of experience in a wetsuit and flippers! With a rocky sandy cove met by clear turquoise waters, Ramla Bay is a fantastic addition to any Gozo holiday itinerary. Soak up the sun as you feel the sand between your toes, while admiring your picture-perfect surroundings! This Balearic Island may be widely known for its lively nightlife, but there’s much more to tempt you beyond those golden shores. Ibiza is sprinkled with alluring coastlines and tranquil coves. This impressive natural landscape seems worlds away from the hustle and bustle of the party scene. A charming destination for your April villa holiday, temperatures reach a delightful 20°C. So grab your flip flops and swimwear – Ibiza is waiting for you! 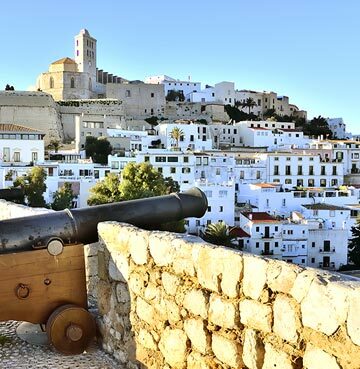 Ibiza Old Town is another world heritage delight. Delve into the historic atmosphere of 'Dalt Vila’s' cathedral and monastery alongside art galleries and enticing restaurants. Explore the intertwining streets and uncover quirky boutiques, market stalls and traditional local cafés. The port is a treat for the eyes as the turquoise waters are met by the colourful yachts bobbing on the surface. If you’re a nature lover, you’ll fall head over heels for Parc Natural de Ses Salines, - a nature reserve on Formentera, simply teeming with wildlife and breathtaking salt marshes. You can hop on a ferry and sail here from the mainland. Or does an active holiday form your ideal itinerary? You’ll be spoilt for choice in Ibiza, with many watersport, parasailing, walking, hiking and cycling opportunities throughout the island. You’ll find an ideal mix of activity and exploration with scenic backdrops serving up picture-perfect views. If you prefer a more relaxing holiday, you’ll have almost 60 beaches to choose from! Find your haven on this island scattered with hidden pockets of beautiful scenery and peaceful bliss. Jet off even sooner with a March villa holiday or wait for the sun to warm up that little bit more, by heading off for a May villa holiday.